For many Tanzanians, the sun sets and it’s pitch black – in fact, according to government data at least two-thirds of Tanzanians don’t have access to electricity. For those who do, many experience problems with reliability and quality of service – i.e. power cuts, and fluctuations in power supply that can damage equipment. This affects people’s daily lives and can be particularly damaging for businesses – from small village enterprises to larger manufacturing industries. The World Bank Enterprise Survey showed that power outages in Tanzania cost businesses about 15% of annual sales. In contrast, a more reliable electricity supply often means higher income and more jobs. The good news is that the gap in electricity access is closing through grid expansion by national provider Tanzania Electric Supply Company (TANESCO) and private ‘mini-grid’ service providers (such as Mwenga Hydro Power, Ensol, Power Corner, and Rafiki Power). Granular data may shed some light. In Dar es Salaam, the Hivos/IIED Energy Change Lab is piloting the Electricity Supply and Monitoring Initiative (ESMI)to gather independent data on the quality of customer supply by placing monitoring devices strategically in homes and businesses across five city districts. This helps customers, electricity service providers and regulators understand where the blockages are. 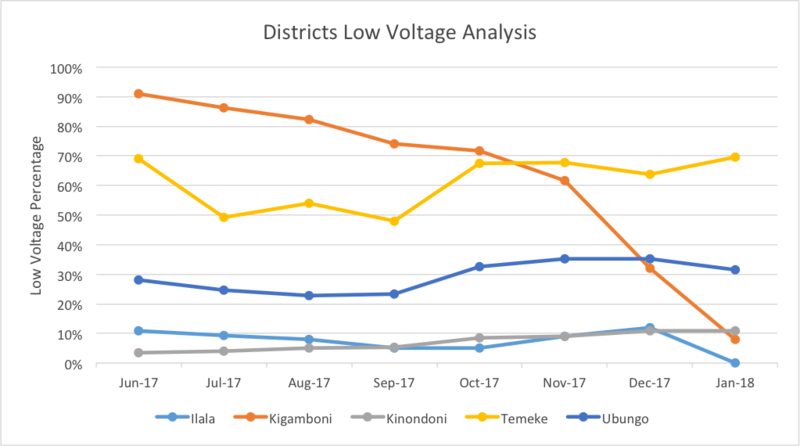 After 8 months of data gathering across 25 locations in 5 districts across Dar es Salaam – namely Temeke, Ubungo, Kinondoni, Ilala and Kigamboni – we have found some interesting trends both on distinct usage and power outage patterns as well as identifying customer behaviour. We measured ‘blackouts’ (Figure 1) as the total number of power outage hours per month. In areas like Temeke, with comparatively high rates of power outages, widespread businesses such as hair salons, restaurants, and medical facilities are often forced to resort to other forms of fuel, such as diesel-powered generators. This has significantly increased the cost of operation that can potentially affect growth of businesses and discourage industrial activities in districts subject to power outages, such as Temeke. 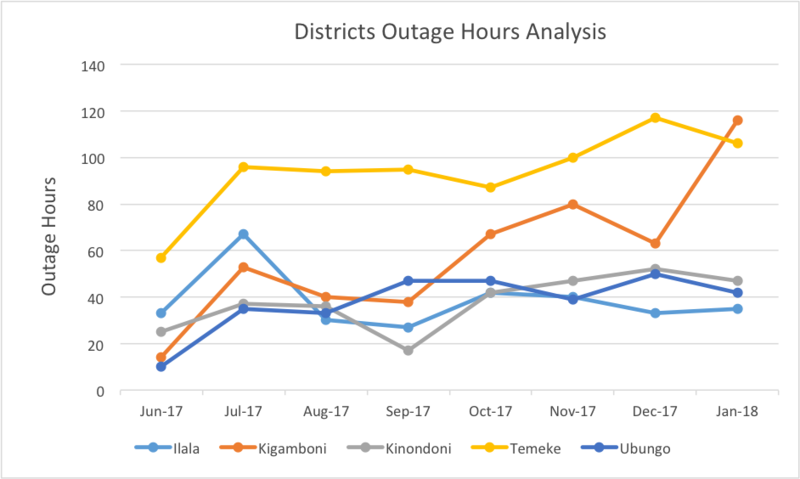 In addition to Figure 1, which shows overall number of power outage hours per month, we measured percentage time where evenings had more than 6 hours power outage between 17:00 hours and 23:00 hours. Again, Temeke took the lead at 26%, with other districts as follows: Kinondoni at 25%; Ubungo at 22%; Illala 14%; Kigamboni at 12%. When it comes to brownouts, Temeke was again the worst performing, with a brownout rate of 30%. Other districts performed as follows: Kinondoni 23%; Ubungo 23%; Kigamboni 13%; Ilala 11%. Data collected during this period shows a significant improvement in Kigamboni over time. Raising awareness of the serious power problem. Availability of quality energy data helps to start a more informed discussion on improving customer perceptions of electricity service quality – prompting service providers to improve customer relations and perceptions about their services. 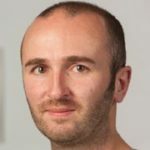 Journalists whose beat includes power supply are making good use of the data for their stories. ESMI data has also been presented at multi-stakeholder energy sector workshops – for example in March in Dar es Salaam, Tanzania – as well as meetings convened by energy regulators. This has helped re-emphasise to regulators and others the value in monitoring power quality, particularly at the customer-level. As part of the ongoing conversation the Energy Change Lab is having with the state utility, our aim is to actively involve TANESCO to aid in collection of more accurate data by working with them to have future ESMI devices installed at the transformer-level instead of having the devices at the household-level to enable the devices to cover a much wider area. The Lab is also keen on engaging TANESCO to validate accuracy of the data we have collected in comparison to their own data to identify areas that might need immediate attention. We also hope this pilot and model of data collection will inspire other operators in off-grid areas to understand the challenges facing technologies they use, and potentially, it will help improve customer perceptions about their services. Currently, we are in talks with TANESCO, exploring the possibility of conducting a much bigger ESMI pilot in Tanzania, we have also shared the ESMI reports with key energy actors and in March 2018, we convened a feedback workshop with key actors to cross-check our findings and suggest cross-sector recommendations. 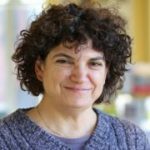 Editor’s Note: An earlier version of this post was first published by The Energy Change Lab.